Before Texas Chainsaw Massacre there was Hooper's first film - "Eggshells" (1968), which has been considered to be a lost film for decades. It's been 41 years since Eggshells was made and we now proudly present its West Coast premiere. These screenings are true drive-in style, so make sure you have a working FM radio in your car. For the latest updates, join our Los Angeles mailing list. Not in Los Angeles? Click HERE for more MobMov! We are a grassroots movement aimed at bringing back the forgotten joy of the great American drive-in. Thanks to the wonders of modern technology, what used to be a dark and decrepit warehouse wall springs to life with the sublime sights and sounds of a big screen movie. The MobMovement began in Berkeley, CA, and has been expanding with chapters in cities across the country. So You're the Hollywood Chapter? Simple. Sign up to our mailing list at MobMov.org. Showings will be held at various locations all around the Los Angeles area. The day before each Mob, we'll e-mail everyone with the location and the movie. If you want to join in, all you have to do is fill your car with your friends and find the spot. 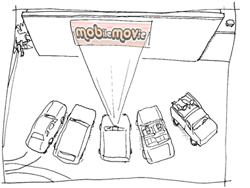 A "mobile movie" or mobmov for short, is quite simply a drive-in that drives-in. Participating in a mobmov is very similar to attending a drive-in from the days of old, except now the projector is located inside and powered by a car, and the audio is piped in stereo over the FM band to your car. It’s a new technological twist to a nostalgic idea. Of course we are! We most closely resemble and revere the Santa Cruz Guerilla Drive-in. But we've gone beyond that original concept. In a traditional GDI like Santa Cruz, a bunch of guys would haul out a projector, some marine batteries, a screen, and some speakers to a park. Everyone in the know would in turn bring blankets and sit down. This is a very cool thing to do, but it's not a "drive-in" in most senses of the term. 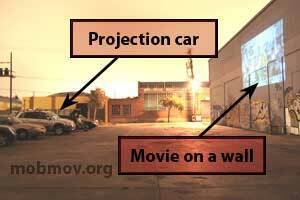 Our goal was to create a true "drive-in" experience by enclosing the projector and an FM transmitter inside a car. Participants drive in to a parking lot, tune their radios, and watch their favorite flick from the comfort of their car. As far as we know, we're the first ones to attempt this (or not). Los Angeles specific Questions? Comments? E-mail us at mobmov@workprint.com.